The first of another two renditions of the breathtaking Resplendent Quetzal in a one-of-a-kind Boruca Ritual mask. Created by Melvin Gonzalez, the son of famed mask maker Ismael Gonzalez Sr, this mask is aprox 18 inches tall and is signed by the artist. Handcarved in a single piece of Balsa wood and handpainted in a painstaking process, this mask reflects the harmonious balance of nature and tradition in the Boruca world. IMPORTANT: only one mask was produced, making this a truly unique item. The photographs you are seeing are specifically taken of this mask. Additional pictures might be available. The mask only weights 1 to 2 pounds but our packaging will increase its weight to 30 pounds of dimensional weight. The shipment is fully insured. The second of another two renditions of the breathtaking Resplendent Quetzal in a one-of-a-kind Boruca Ritual mask. Created by Melvin Gonzalez, the son of famed mask maker Ismael Gonzalez Sr, this mask is aprox 18 inches tall and is signed by the artist. Melvin's eye for detail included the carving of the Quetzal nest hole on the top of mask. A beautiful rendition of birds in a one-of-a-kind Boruca Ritual mask. Created by Carlos Rojas, a disciple of famed mask maker Ismael Gonzalez Sr, this mask is aprox 18 inches tall and is signed by the artist. 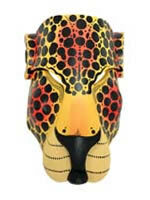 Toucans like you have never seen before in a one-of-a-kind Boruca Ritual mask. A second work featuring Toucans in a one-of-a-kind Boruca Ritual mask. Created by Carlos Rojas, a disciple of famed mask maker Ismael Gonzalez Sr, this mask is aprox 18 inches tall and is signed by the artist. It is a perfect match to the first Toucan mask if you wanted to feature them together. This is an artistic representation of the fierce character that lives in every Boruca tribesman. A break from the traditional Boruca mask, this work of art belongs to young artisan Randall, a member of an artisan group lead by Master Craftman Ismael Gonzalez Lazaro. Randall, and 12 other Boruca children, were trained by Ismael Gonzalez in the art of mask making when they were in their early teens and now, 15 years later, are introducing designs with a personal touch. This mask breaks with tradition in four areas: the size, this mask is 16 inches tall; the composition of the evil characteristics, the choice of wood which is balsa and the colorful painting. IMPORTANT: these masks are a work of art and it is impossible to make them all look the same. Subtle differences in the carving and painting pattern might be found. You can never expect your mask to look exactly like the one pictured here. Please don't consider these differences a mistake on our part. Shipping weight has been increased to allow for the packaging needed to deliver the mask safely to you. Shipping charges include insurance. This mask depicts the Jaguar, an important animal in Boruca mythology and a participant in the Diablitos Dance ritual. This mask is handcarved and painted by young Boruca artisan Carlos Rojas Lazaro, a member of an artisan group lead by Master Craftman Ismael Gonzalez Lazaro. Carlos, and 12 other Boruca children, were trained by Ismael Gonzalez in the art of mask making when they were in their early teens and now, 15 years later, are introducing designs with a personal touch. 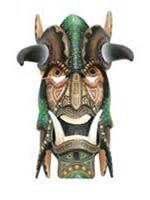 This mask breaks with tradition in the choice of wood, which is balsa and the colorful painting.